The graph above illustrates the monetary base in blue vs the employment ratio (number of people working / total population) in red. 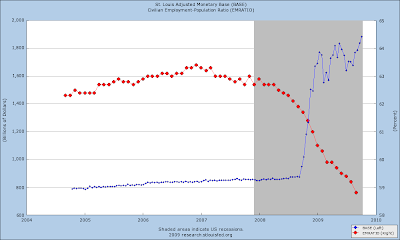 Quickly increasing M0 was part of the US government's strategy to save the banking system, so the drastic increase that you see in the graph above is much just a blip in the M1 and M2 numbers. As banks begin to lend again, the graphs of M1 and M2 will start to look like M0. Presumably more people will be employed by then, so the red line will head back up. This looks like a good time to be working. You've got more and more dollars chasing fewer and fewer workers, so it seems likely that salaries will be increasing. That supposition depend on the velocity of money, but that only looks to be down about 12% year-to-year.